Veganism has emerged as one of the top food and lifestyle trends in the past few years, and 2018 has been a pivotal year for the movement. From Benedict Cumberbatch to Beyoncé, celebrities have lined up to endorse cutting down on meat, and retailers have been stocking up on everything from vegan shoes to burgers. So is it a fad or is the vegan diet really the future? Based on our latest research, here are five snackable insights into Veganuary, i.e. the movement to inspire people to go vegan for the month of January, and plant-based diets in general. 1. Flexitarian diet is more common than vegan or vegetarian diets. A special study we ran in January 2019 showed 17% limit their meat consumption, also known as being flexitarian. Flexitarians either limit how often they eat meat or cut out some forms of meat. Even when excluding people who cite religious reasons (e.g. people who eat kosher or halal) for not eating certain meats, this still leaves 14% – a considerable chunk of the market. Vegans and vegetarians account for around 6% of U.S. and UK internet users aged 16-64. They might be a growing audience, but they’re dwarfed by the number of people who just want to cut down their meat intake in general rather than commit to a defined diet. 2. Health motivates meat reduction, animal rights motivate meat exclusion. Those who choose to cut down on their meat intake mostly cite their health as the reason behind it. Despite the many campaigns calling for people to reduce their intake of meat to protect the environment and combat climate change, these concerns are less significant. This also applies to people doing Veganuary. Many participants have also taken part in challenges like Dry January (35%) or Stoptober (16%), so it ties in with an idea of self-care and taking on challenges in the run-up to or after the indulgent Christmas season. The stand-out reason for taking part is to improve one’s health, although there may be more varying motivations behind Veganuary than other challenges. 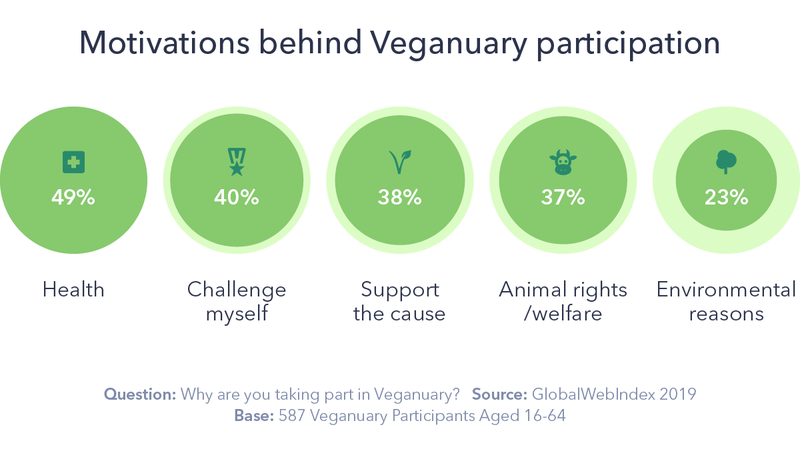 Doing Veganuary as a personal challenge, to support the cause, and for animal rights are all cited by around 40% of participants. 3. Awareness campaigns do matter – to some. The divide in motivations between meat eaters and full-on vegetarians and vegans also means they respond differently to campaigns. PETA, for instance, focus heavily on animal welfare and climate change in its brand communications, which is less impactful with people who would be more inclined to cut down on meat for other reasons. So what techniques are more effective with those on the verge of cutting meat from their diet? 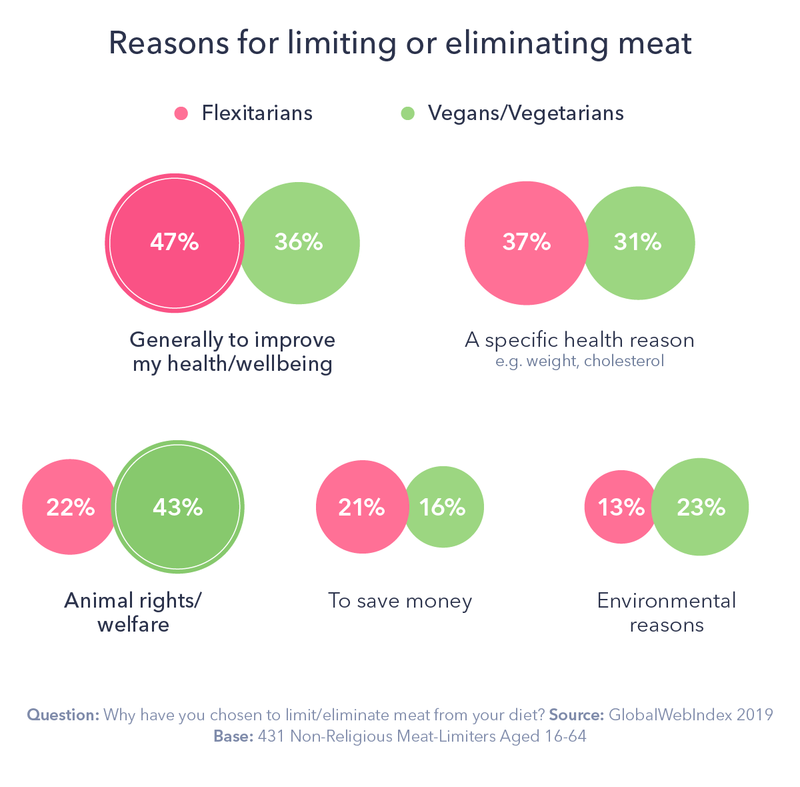 Our research indicates that flexitarians are more influenced by expert opinions and personal connections when making the choice to exclude meat from their diet. 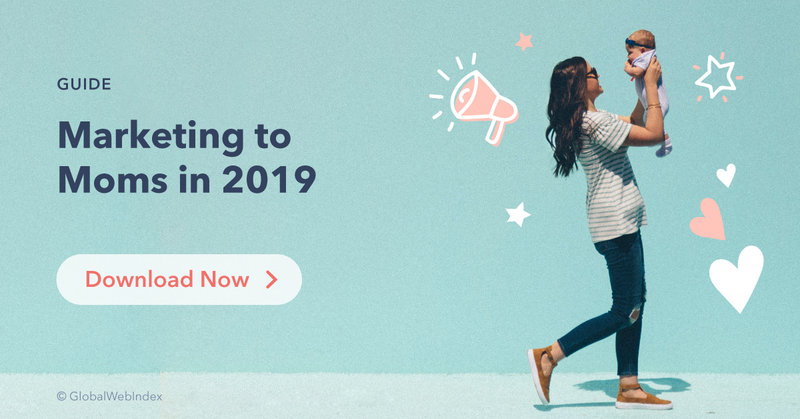 A heavier focus rests on building a trusted community around veganism or Veganuary by prompting supporters to share knowledge, progress and health benefits from the challenge. This is done in the hope it might inspire flexitarians to join the meat-less journey. Having the willpower to stick to Veganuary is a challenge in itself for this audience, beyond the substance of it. Strategies focusing less on self control and more on external accountability and financial incentives might prove effective. For example, users can set up “commitment contracts” on platforms like StickK and face a “fine” if they fail to maintain the commitment. Such platforms or forums for bragging rights also allow taking on challenges for charity, or just sharing the “love” amongst the challenge takers as well. 4. Veganuary attracts a diverse crowd. Nevertheless, Vegunary and similar movements do inspire some share of U.S. and UK consumers to cut down on meat longer term. 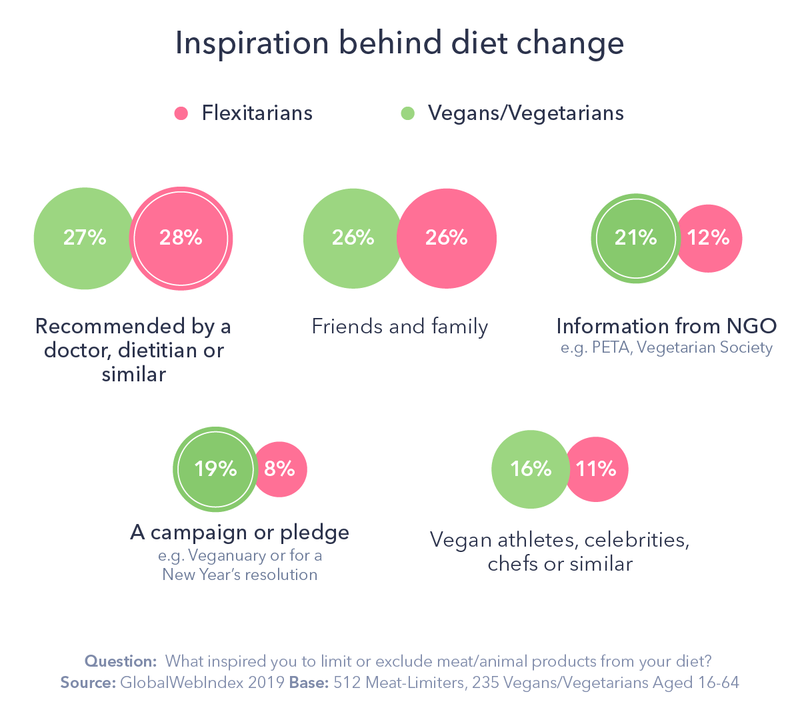 8 in 10 of the people doing the challenge do eat meat in general, though the ratio of flexitarians doing Veganuary is much higher than in the wider online population. Men and women are equally likely to participate, but there’s a strong age bias. 57% of those doing Veganuary are under 35, and participation peaks among people in their late 20s to early 30s. When we look at education, we see a significant skew towards higher education. People doing Veganuary are more likely to be university-educated (1.3 Index), especially to a postgraduate level (1.5 Index). The real common motivator is being interested in challenges, of course. 63% of U.S. and UK consumers have never done a monthly challenge before, whereas 85% of Veganuary participants have. If we consider the charitable and social movement aspects of these challenges, it makes sense that health-conscious consumers are trialing healthy-living through these nationwide, or even worldwide, initiatives. 5. There are clear differences of perception. 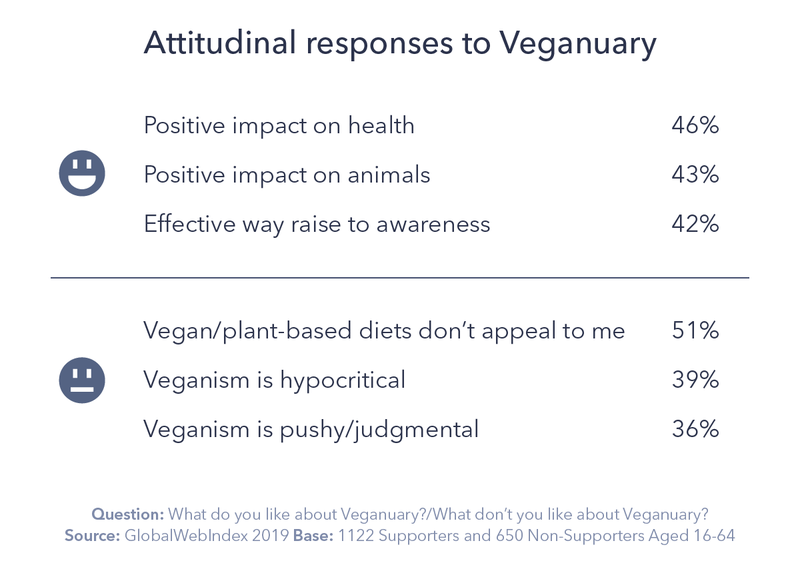 People who’ve heard of Veganuary have mostly positive views of it – 43% either support or strongly support it, whereas just 25% don’t support it or are outright against it (6%). However, there’s a large generational divide. 37% of 55-64-year-olds don’t support or are against Veganuary, compared to just 14% of younger audiences. Considering younger audiences’ openness to trying new things and propensity for new challenges, this gap is not that surprising. Surprisingly, there’s a large national difference, too. The U.S. has been the home market of many, if not most, global food trends, and Veganuary has the support of 38% of respondents in the U.S., vs. just 23% in the UK. After age, it’s the starkest contrast in opinion. Overall, we know the practical health and ecological benefits stand out, and the general dislikes seem to be more about just personal choice. This shows there’s still some awareness work to be done by vegans and Veganuary campaigners to win over the meat eaters on the vision and aims of this movement. Many food brands have bought into the vegan movement by offering alternatives to appeal to a broader customer base – such as the always-sold-out Gregg’s vegan sausage rolls in the UK, and Beyond Meat and Impossible Foods in the U.S., the latter backed by Bill Gates. Brands need to be aware that different demographics widely differ in their opinions on veganism and the January challenge. That said, pro-veganism campaigns and products are widely popular and are worth trialing by brands, especially as this means not only tuning into the community and environmentally-focused vegan audiences, but also to the health-conscious flexitarians. With only a few days of Veganuary left to go, it remains to be seen whether challenge takers will stick with a plant-based diet or not. The post 5 Things To Know About Veganuary and Veganism appeared first on GlobalWebIndex Blog.